I strongly believe that slow cooked food can be magical. There is nothing that can match the taste of a dish put together by someone who slogs meticulously for hours over it. I love such food. As long as someone else cooks it for me! When I am in the kitchen, I am all about convenience and kitchen hacks to save my time. I believe in cooking dishes that taste great but don't involve my being in the kitchen for long. I am very happy to use devices that save time. In the early years of our marriage we used the microwave a lot for cooking much to the consternation of readers from the US who said that they use the microwave primarily for heating. Then we bought an oven for me to bake in. I baked a couple of loaves of dense breads and some lovely (so K tells me) cookies and brownies basis what I learnt in classes that I attended in the Le 15 Studio. Then I got bored of baking. I continue to use the oven a lot though for grills and roasts. The plate in the picture above tells the story of a new, well not so new now, member of our kitchen. I am talking of the air fryer. If you follow me on Instagram or on Twitter, you would have seen me post pictures of food that I make in the air fryer. I don't think that I have written about the air fryer on the blog before this so here goes. 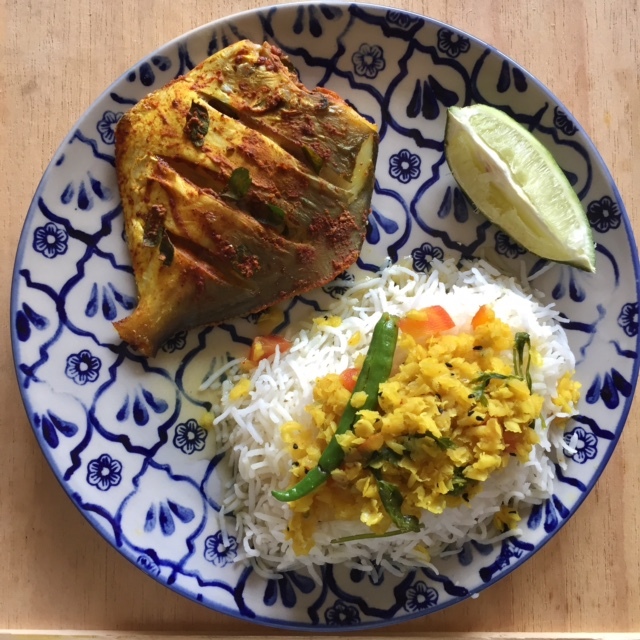 What you see on the plate is orange masoor or mooshor or mooshurir dal made in the microwave, rice made by boiling it in a pan and draining the water AND pomfret cooked in the air fryer for 15 min at 150 c. I had marinated the fish in a mix of red chilli, garam masala and turmeric powders with salt and a bit of mustard oil and added some curry leaves for flavour. The meal took ten minutes of my time to put together and tasted pretty good. I have used various marinades in the past while cooking fish or chicken in the air fryer. Korean gochujang sauce that Jean got me from Seoul for chicken legs. Chicken wings in either balsamic vinegar, honey and oregano and so on or in honey, soya sauce and chilli sauce. Both of which are big hits in parties thrown at home and give some competition to our cook Banu's mutton pakke kheema ke kebabs which are a legend among our friends. I do cook fish like rawas fillets (Indian salmon) or pomfret in Chinese sauces. I have tried mackerel in Koli masala that Anjali Koli has given me though this tastes way better when actually fried. I occasionally do chicken or salmon in an olive oil and sumac, zatar and dukkah sort of Mediterranean marinade. Rohu or kaatla in a simple turmeric and chilli mix. The other dish that I do in the aair ryer is parboiled cubed potatoes finished with some salt and pepper and occasionally turmeric too. The point I am trying to make is that instead of following recipes, your should experiment in the kitchen while using the airfryer and surprise yourself. I got the air fryer more than a year back. I was engaged by Havells to shoot some recipe videos for them. The producer from the agency came to me with 'trendy' dishes to shoot. Once the project was done they told me that I could keep the air fryer. So I began to use it in cooking day to day stuff. Food which was tasty even if not trending on social media. Soon the air fryer became a regular fixture in our kitchen. I think I use it way more than I use the oven now. So I thought I will share some of the things which I have observed about using air fryers after more than a year of heavy use. I guess my answers would be generic to the category and not just for the Havells air fryer. This is not a sponsored post after all. I thought I will try to address questions that people often have about air fryers. The answers are based on my experiences over the last year of so. 1. Is the effect the same as deep frying? No, but it does give a nice crunch and browning and tastes good overall and different from food which is just steamed or grilled in the oven. Some fish such as bangda or mackerel taste way better when fried outside but for fish like rawas, surmai or pomfret and for chicken too, this is pretty good. Potatoes turn out well. 2. Does one need any oil while using the air fryer? You can do completely oil free cooking in it. Especially for chicken and fish which has its own fat. I do add a teaspoon or so of olive oil to the marinade at times while making western grills or mustard oil while using Indian spices. Gives a nice glaze, helps the spices mix well and adds to the taste. You CAN cook these without oil though if you need to. 3. Is it good for non-vegetarian food or vegetarian? I find it to work very well for chicken and fish. I've not tried to cook red meat in it or shell fish like prawns. I've done potatoes and that works well. I am yet to crack other vegetables. Cauliflowers turns out decently if you parboil it first. Same works for potatoes too. 4. How does it compare with an electric oven? 4. For non-vegetarian food, do we need boneless meats and fish fillets? Not really and food cooks better and tastes when cooked on the bone. 5. Can you do desserts and bakes? Not, my area of expertise. I've never tried to. 6. Does it work for large families, parties? 7. Can you do wet batter stuff like vada pav and all? Not really tried it. The base has holes so if you do, you need to place a cooking foil at the base. We recently did some Bengali club styled fish fry with a tight bread crumb batter. That worked well though batter in the end result was not as brown as that when fried. However, took minimal oil and effort compared to frying. Tasted decent too. 8. Should you foil wrap the food and cook? I don't do so as I look for a bit of crunch and bite when using the air fryer and your the oven for steaming and roasting. If you don't have both you can try it here. 9. Is it big? Easy to clean? 10. Does it use a lot of electricity? Can't say as we get a composite electricity bill. 11. What are the cooking times required? You need to pre-heat it for 10 min at 200 or 150 C. I cook fish for 12 - 15 minutes. Chicken for around 20 to 25 minutes. Potatoes if par boiled for 20 min else, 30. I usually cook at 200 C. I would urge you to experiment with yours and see what works best. 12. Which brand to buy? We use the Havells air fryer and are happy with it. Don't have a point of view on the others as I haven't used them. If you have then I would love to hear from you on that. 13. So should I buy an air fryer? Yes, if you need to cook food which is low an oil. If you do, then I do like the fact that the air fryer is fast, hassle free and gives a bit of crunch or texture to dishes. If you have any other questions then please write to me. If I find them very relevant I will add them to the post too.